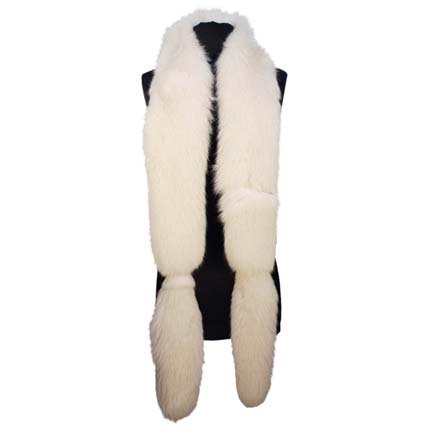 This vintage white fox fur stole was worn by pop entertainer Christina Aguilera in the video for her 2006 Grammy Award winning song “Ain’t No Other Man”, the lead single off her 2006 album “Back to Basics”. Ms. Aguilera, as her alter ego “Baby Jane”, wears the stole over her shoulder in front of a blue Art Deco backdrop in the vintage 1920’s and 30’s Hollywood club scene inspired production. Ms. Aguilera won a Grammy for Best Female Pop Vocal Performance in 2007 for “Ain’t No Other Man”, and the video was nominated for Best Video of the Year, Best Female Video, Best Pop Video and Best Choreography at the 2006 MTV Video Music Awards. The stole is in vintage condition with some evidence of age as seen in the video, and is accompanied by a letter of authenticity from the costume house that supplied the piece for use in the video.